The Christ-Centered Exposition Commentary is a welcome addition to the growing number of resources which help explain the biblical text and apply the truth of God’s Word to readers. This volume which that focuses on four minor prophets beautifully captures the essence of each book and ultimately points to the central figure in Scripture, the Lord Jesus Christ. A predictable pattern occurs throughout this work as the authors present the main idea of the book under consideration. A brief outline is presented to give readers an overview of the biblical text. The major points are explained and highlighted. Finally, an application is presented which is linked to our current generation. Discussion questions are included for the benefit of readers at the end of each chapter. I cannot speak more highly about the Christ-Centered Exposition Commentary. A solid Reformed framework fuels this theological engine. Indeed, the gospel, in keeping with Scripture runs throughout, all for the benefit of the reader, and ultimately for the glory of God. These volumes are accessible to a wide range of readers and will no doubt encourage a deeper study of the biblical text. This year, I set out to read all fourteen volumes of the Lloyd-Jones series on Romans. The first volume, Romans – An Exposition of Chapter 1: The Gospel of God is a theological feast for the soul. These messages are a part of a fourteen-year journey that Lloyd-Jones led his congregation through before his death in 1981. The first volume guides readers through Romans 1:1 – 1:24, nearly four hundred pages – which should be a good sign for anyone who values solid exposition. James Boice was God’s special gift to the church. When he died, Boice left an enormous hole that no other person will ever fill. He demonstrates his giftedeness in his commentary on Nehemiah. The author presents a series of “dynamics” that are packed into the book of Nehemiah. Principles of leadership, delegation, and management are explored. 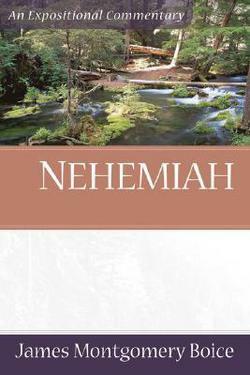 Boice helps readers deal with opposition by using Nehemiah’s godly example. He notes how success breeds opposition, and how detractors will often use tactics of ridicule or even violence. Nehemiah’s leadership shines brightly as he faces the opposition on multiple fronts as he rebuilds the wall. Part two examines the rebuilding of the nation. The broad strokes of revival are set forth which include prayer, the read of God’s Word, the preaching of God’s Word, and sorrow over sin. James Boice is always a pleasure to read. The gospel is front and center. The scholarship is impeccable. And God’s Word is exalted to its rightful place.